On May 12 the Upper House of the German Federal Parliament (Bundesrat) approved amendments to the Road Traffic Act (RTA) setting legal requirements for automated driving beyond “partial automation” in Germany. The revised legislation came into effect on June 21. 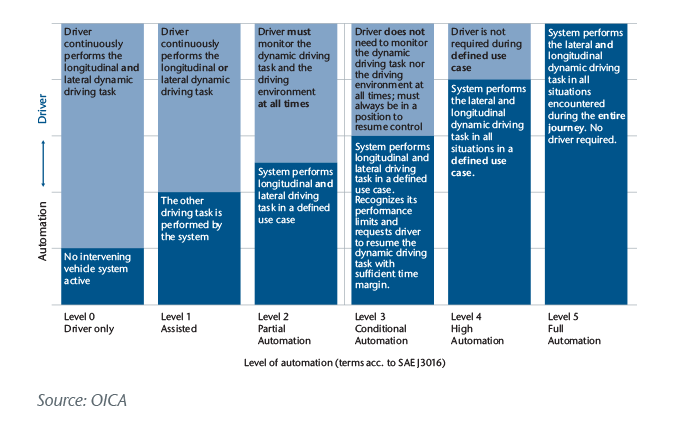 The revised Act, which passed the Lower House of Parliament (Bundestag) in late March, allows drivers to operate cars with Level 3 and 4 functionality, i.e., “conditional automation” and “high automation” according to the international nomenclature1 (described below). The new law states that the driver remains legally in control of the vehicle, even when Level 3 or 4 automated functionality is engaged. However, once the law is in effect, drivers using Level 3 or 4 functionality will be free to turn away from the traffic environment and vehicle control, provided they maintain a sufficient level of alertness so that they can resume control when prompted to do so or when the system is recognizably beyond its performance limits. All vehicles with Level 3 and 4 functionality will be fitted with a “black box” that will record the data of each journey. In the event of an accident, the data will be used to ascertain whether the driver or the automated system was in control of the vehicle. The issue of data protection – with regard to the driving information recorded during each journey – will also be revisited. The revised RTA has been warmly welcomed by the German auto industry, not least because it lays the foundations for the development of a legal framework for fully autonomous (driverless) vehicles in the future. However, given that a study commissioned by the German Federal Ministry for Economic Affairs and Energy predicted that by 2025 the German market for driver assistance systems and automated vehicles will be worth EUR 8.8 billion and create nearly 130,000 jobs, there are many factions with a vested interest in ensuring progress continues to be made. The revised Road Traffic Act does not follow the SAE nomenclature commonly used in the international context. The reason is that the German Federal Highway Research Institute or “BASt” (Bundesanstalt für Strassenwesen) decided a few years ago to adopt “labels” for the levels of automation that differ in part from those used by the SAE. Thankfully, the narrative used for the various levels is very similar. While the revised RTA follows the BASt nomenclature, in order to avoid confusion for international readers, the SAE nomenclature has been used in this article. The table below juxtaposes the “labels” for both nomenclatures. Schubert, Autonomous Cars, Initial Thoughts About Reforming the Liability Regime, Insurance Issues, May 2015, p. 4 – 5, considering absolute product liability (no defect required) as an alternative.